These two factory teas are about the same age- or purportedly from 2004 and potentially with some wild tree content. Your eyes might pop out at the ever so light straw colored brew and green green leaves on the left but this tuo has been drying away with me in Berkeley since Feb of 2006. Even back in 2006 and in comparison with the 2004-2006 versions of this cake, I had no doubt as to the age of this tuo plus it had a convincing factory stamp. Which brew do you think is more bitter? The humid stored brew on the right still holds onto an obvious plantation bitterness while the barely aging wild tree tuo on the left is smooth to drink now as it was in its youth. "This brick is going for about SIN$5, isn't it? There are fake ones in the market, so be careful when you hunt for it, the similarities between the real and the fake are hard to tell. 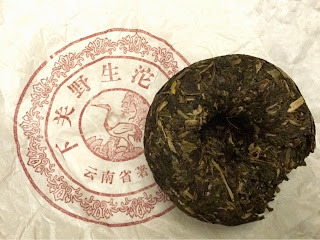 The first production from Chang Tai's new factory in Jinghong city, using a blend of old abandoned leaves and cultivated ones. Most of these bricks were snapped up by a Hongkong tea vendor." At SIN$5, it probably wasn't the finest Banna brick and this one certainly tastes like that kind of cheap plantation brick; it must have been a tongue scraper back then and such tea demands humid storage. I brewed up so little that I wasn't able to differentiate two set of leaves to confirm a blend of older leaves with taidi cha. I was surprised anyone would even bother to forge such a low end brick but I remembered back then you could get an entire 6 FTM beeng or a Lao Tong Zhi for just a few bucks. You can see the Changtai wrapper is quite bug eaten and one whiff lets you know this cake enjoyed humid/light wet storage although it has no visible signs of surface mold. I'm assuming the 401 means 2004 first batch. The specimen I have compares to other 10 year olds. I would be okay to buy this for $16 with shipping- the Changtai part really doesn't matter to me that much. The cheapest deal on ebay is $16 with shipping but I wasn't diligent so I paid a tenner more. It's not the best, it's not the worst. I don't have that many humid stored examples yet so it's okay to fill out. Next. This age defying tuo is the '04 Xiaguan Wild Tree. It smelled incredible when it arrived- it emanates the fragrance I associate with fermenting overripe blackberries when I pick them later in the season. The intensity of the scent on this tuo fluctuates with the seasons being most subdued during the winter. Like it's XG beeng counterpart, this tuo is a mellow brew without the usual XG mouth drying powers. You can see a fair amount of huangpin and older leaves which must be the old tree part. And is customary with XG style- the leaves are all chopped up and the compression so tight, you need to sweat and bleed to get some flakes. This XG tuo is aging much slower than my 2004 plantation tribute melon of the same size -250g with equal or greater compression. My melon has been progressing respectably and is entirely drinkable now even for me so it's more leaf composition rather than compression or storage which keeps this XG evergreen. 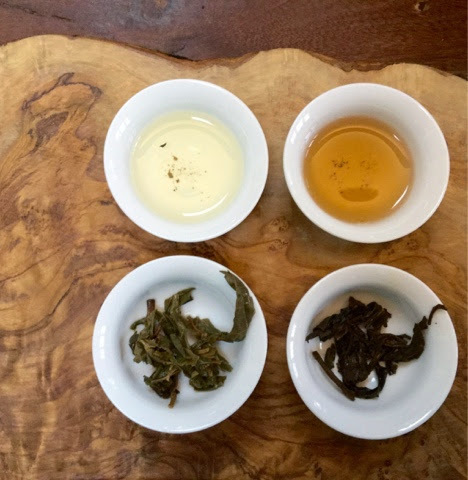 The excess carbon in the huangpin and the older leaves make it extremely slow to ferment. Because the heady fragrance of this tuo is so lovely- I shudder at the thought of this scent being contaminated with a shicang aroma. I don't mind this tuo is never to age. I've easily gotten a thousand huffs out of this tuo and the fragrance alone makes this worth holding it young forever. I'm going to guess the one on the right but I can't wait to hear your answer! I recently drank a 1970's sheng that was very, very, very smooth. It was a very special treat. You are entirely right. You are onto me! I like to undress my tuos and put them in more comfy pajamas so they can feel more casual. Factory tuos always come in such stiff attire. 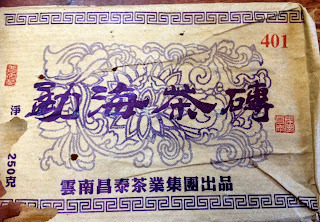 Chawangshop has some lovely handmade mulberry wrapper paper I highly recommend. p.s. Thank you for your support. I'm trying to figure out how to wind down this blog gracefully as I'm not sure how long I can go on and on about tea. I am more than happy to pass the memoir based tea blog mantle all to you. I'm pretty sure tuocha is compressed and packaged that way to endure the hot and humid climate of Hong Kong. I know a few vendors (who have their own pressings) would throw in some blank paper for free if you ask. Chawangshop seems to have a ton of miscellaneous teaware/accessories which is nice though. My poor teas are drying away but not dying. Do you not lose hope to hear such news when Wisconsin is a colder and drier clime? I fear I'm a wet towel for those attempting natural home aging by buying newborn sheng. Of course if I had read a blog like mine 10 years ago, I probably would have disregarded it and bought my young sheng hoard anyway.